Even with the fashion world's fickle taste for trends, a love of sneakers has remained a constant for the last few years. 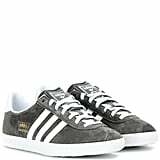 But the trendsetters' allegiance to brands shifts constantly, alternating between designer riffs on the classics and standbys from Converse, Puma, Nike, and Adidas. The Stan Smith and Nike Cortez have been the favored pairs as of late, but there's a throwback sneaker that's about to take over. The proof is already bubbling up on your Instagram feed, starting with an appearance from Kate Moss. 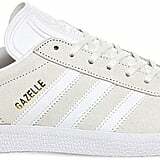 The supermodel, who starred in Adidas's '90s campaign, is back for the Gazelle's relaunch. 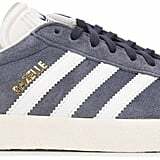 "Gazelle's were the trainer we all wore in the '90s," Kate wrote in a caption on the Adidas Instagram. "They have a timeless look that just doesn't date. 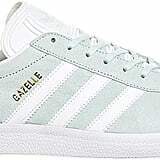 I was and always have been an Adidas girl." 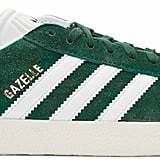 With Moss backing the return and the hashtag already gaining traction, the Gazelle is about to be everywhere. Read on to glimpse the campaign, the ways fashion girls are wearing theirs, and where to buy your own pair before they're gone.